Air Ankle Stirrup – Pacific Medical, Inc. Durable plastic outer shells conform anatomically to the ankle. Inner air bladder foam cushion for added support. Air volume can be adjusted with included inflation tube. 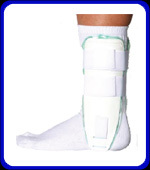 Designed for acute treatment of ankle sprains and strains, as well as injury prevention. Available in three heights, universal in size.